This lonesome stone can be found just off the A712 about 8 miles North West of New Galloway, and on the shores of Clatteringshaws Loch. 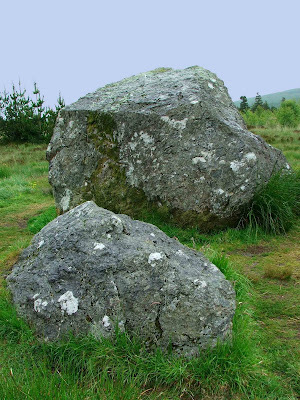 The huge stone and its smaller partner, sit on the shores of the loch with magnificent views out towards the Low Craignell, Cairngarroch and the Rig of Clenrie. These mountains provide a stunning backdrop to the forested shores of the loch, and on a clear day must be brilliantly green, red and purple with the heather and bracken cloaking the mountain sides. The stone is said to represent the spot that Robert the Bruce rested after defeating the English in 1307. The actual battle ground lays across the loch, and is now submerged beneath the water of the damned loch. The battle of Glen Trool, was one of a number of defeats that Bruce dealt out to the English on his way to slaughtering the English garrison at Aberdeen, and to controlling all of Scotland North of the River Tay in 1309. The stone is set off the road, about a ten minute walk from the secluded car park. The path leads you through quite a marshy area, but luckily the path has been well prepared and is walkable even in the wet.